A cheesy pizza or a yummy sideline, Domino’s pizza has it all. With four different crusts and a variety of chicken, beef, veggie and cheese toppings, it has too much to decide. It has four different kind of dips and variety of extra toppings available on the menu. What makes a difference is that Cheetay is ready to do Dominos delivery even at places where Domino’s riders are not ready to deliver. So, click to order online and get piping hot pizzas, your favourite sidelines and desserts delivered instantly. Who can miss those tender chunks of chicken or beef with crunchy vegetables and cheese melting in the hot oven? If you are a pizza lover, you never would. So roll over and scroll down to see what Dominos is offering you. Start with the hand tossed pizzas that have soft dough which is spread out by hand on the pan after giving it time to rise. It is brushed with oil that is buttery garlic in taste. Once baked in the oven it is flatter and crispier. It has a baking process that is unique and oil free. A form closer to this is a pan crusted pizza. This is made by soaking oil into the dough just like focaccia bread. The dough is put into a deep dish and then baked. A third form of pizza crust is known as Italian Thin. This has Italian seasoning in it to enhance the flavor of any topping of your choice. An interesting combination of toppings and pizza dough is Crunchy Thin. It is very light and crispy once baked. You can enjoy the flavor of toppings more. If you like the cheese to be at the base of the pizza, then opt for premium crusts. These include the Double Melt crust or Cheesy Burst crust. Double melt crusts have creamy chedder cheese sauce spread out between two crunchy thin crusts with any topping of your choice while the Cheesy Burst is a thick crust pizza filled with chedder cheese underneath your preferred topping. 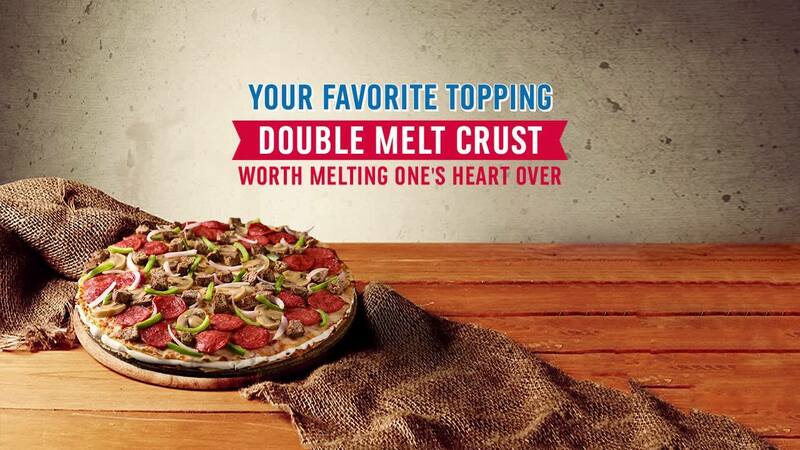 When ordering Dominos pizza online, think of the type of toppings you want on your selected crust. It could be a topping from value and veggie flavours such as BBQ, Spicy Chicken, Cheese or Veggie; Chicken toppings that include Cheese Burger, Tex-Mex, Chicken Tikka, Legend-Ranch, Pakistani Hot, Hot & Spicy, Tandoori Hot, The Jamacian, Buffalo Wild, Golden Delight, Legend-BBQ, Mirch Masala or Beef toppings that comprise of Cheese Burger- Beef, Pepperoni Passion, Pepperoni Hot, Extravaganza, Beef Deluxe, Italiano, Hawaiian. Once you have chosen the topping of your choice you can choose any veggie or meat that you want to add on. These include Mushrooms, Green Chillies, and Tomatoes, Green Pepper, Onion, Beef Italiano, Cheese, Sweet Corn, Olive, Pickles, jalapenos, Pineapple and Pepperoni/Chicken Tikka/Chrispy Chicken/Legend. To fully enjoy a hot pizza, choose any dips of your own choice. These include Chilli Sauce, BBQ Sauce, Traditional Marinara Sauce and Classic Ranch Sauce. So when you think of pizza, see Domino’s pizza deals and meals to get them delivered through Cheetay straight to your location!